For the $99 online price, The MyTouch 4G Slide is probably the best bargain on T-Mobile. T-Mobile has a few key brands to its name, and in the Android world, MyTouch is one that draws its lineage all the way from the second Android phone ever sold stateside. Surprisingly, instead of relying on the name to sell the phone, T-Mobile and HTC have created a real bargain with the MyTouch 4G Slide. Though we have some small issues with the phone, for $99 (currently a Web-only offer), it’s one great deal. The MyTouch 4G Slide is not a lightweight phone, by any definition. We wouldn’t say it’s too heavy, but it does weigh in at 6.5 ounces, more than 1.5 ounces heavier than the iPhone 4. With that said, the iPhone 4 does not have a full QWERTY keyboard. The MyTouch 4G Slide does. The 4G Slide has a black front, brushed metal bumper, and tan or black shell (depending on your color choice). At 3.7 inches, the LCD screen on the 4G Slide is a bit larger than the iPhone 4, which is a nice compromise for those looking for a bit of real estate, but without having to buy a massive 4.3-inch phone. This may be a feature of the software, but we also found the touchscreen to be faster and more responsive than most. The face buttons on the 4G Slide are a welcome change from the usual haptic touch buttons we get on most Android phones. They’re perfectly sized and have a good click to them. They feel fairly durable as well. We’re not so sure about the MyTouch Genius button, though. As with other MyTouch phones, T-Mobile has removed the Google Search button in favor of a Genius button, which has a list of voice commands you can use to search for things, call friends, send texts or email, or find businesses. We found the Genius search to work as well as Google’s voice search, so we can’t complain much. With more and more manufacturers using their own proprietary voice search, we hope Google takes note and improves its own voice search. A few smartphones still have touch pads, a remnant of the pre-touchscreen era. The MyTouch 4G Slide’s touchpad is more effective than most, and doesn’t feel like a complete waste of space like the Sidekick 4G‘s touchpad did. Few phones have full slide-out keyboards these days, but it’s nice to be able to type and look at a full screen of content. Onscreen keyboards take up so much real estate. The sliding mechanism of the MyTouch 4G Slide is fantastic. This is one of those phones that you’ll slide open and shut out of habit because it just feels fun. Using the keyboard is not as rewarding an experience. The four-row QWERTY keyboard has all the buttons it needs, but it’s a bit too flat and stretched out for our purposes. 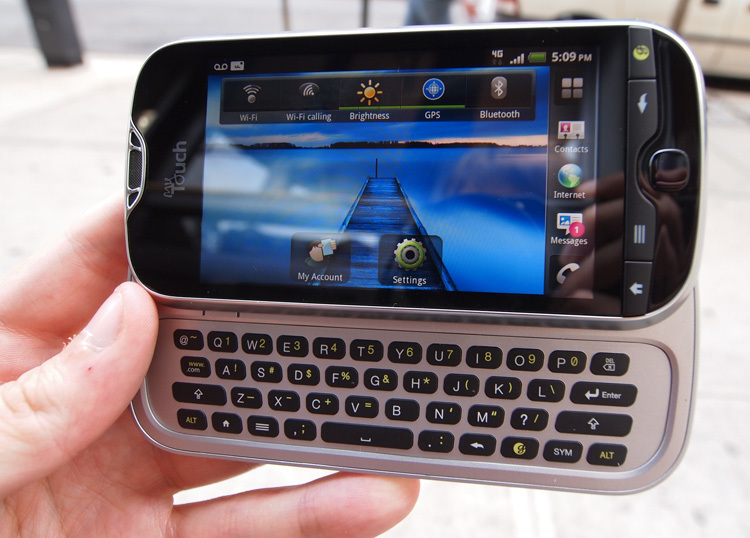 After a while, we got used to it, but it does not match up to keyboards on the T-Mobile Sidekick 4G or the Motorola Droid 3. These devices have a dedicated number row and feel natural to type on. For all its space, the 4G Slide isn’t quite there. While we were initially puzzled by the decision to put the volume rocker and power button on the left side instead of right, the decision makes sense because it puts your hand in the correct position to slide open the device and shift into a typing position — smart design on HTC’s part. The volume rocker is a bit hard to find if you’re shuffling for it in your pocket while listening to music, however. Since it has no physical markings on either side, it’s difficult to tell if you’re about to move the volume up or down. Once you use the phone enough, this shouldn’t be a big issue. Despite its low price, the MyTouch 4G Slide packs more power than almost any other phone on the market, on T-Mobile or any other carrier. Packed inside is a 1.2GHz dual-core Snapdragon processor, 768MB of RAM, and 9GB of memory storage (1GB internal, 8GB microSD card). The screen clocks in at 3.7 inches and has a resolution of 480 x 800, which is a bit low considering some phones are exceeding 960 x 540 these days, but the highly responsive HTC Sense 3.0 and Android 2.3 experience make up for the difference. Camera geeks should get most excited, however. The 4G Slide has one of the best cameras (8-megapixel) we’ve seen outside a Nokia phone. It can record 1080p video as well. Almost every Android phone comes with a few pieces of flair that the manufacturer throws in to make their devices stand out from the pack. We’re excited to say that the 4G Slide comes with Android 2.3 underneath, which is a much more stable and improved OS than Android 2.2, which was on almost every phone until late July. HTC’s Sense 3.0 UI is arguably the best-looking user interface available. Thanks to the dual-core power of the phone, you’ll get plenty of pretty 3D effects as well. No other UI has as many widgets, themes, visual flourishes, and useful modifications. We particularly like how HTC added a quick settings dialog in the Notifications bar. If there is one downside to owning an HTC phone, it’s that the company insists on modifying or replacing Google’s apps to fit the design and themes of HTC Sense. While they definitely look good, it also means that several core apps, like Google Navigation and Places, are missing some really great features that have been added this year, like turn-by-turn walking directions and searching for restaurants that are currently open. HTC’s music app also lacks the ability to connect to Google Music Beta. These are small issues, but we’d really like to see HTC update its core apps more often. As usual, there are a few unremovable preloaded apps. The standard set of T-Mobile apps come preloaded on the phone, as does Bejeweled 2, dT Sync (not a bad app, actually), Netflix, Polaris Office, and Zinio Reader. HTC’s Web browser isn’t terrible, but also suffers from a few annoying issues. Mostly, unlike Google’s browser, it does not automatically resize webpages. Instead, it leaves them full size, forcing you to zoom out yourself or scroll around the page. It’s not hard to zoom out, but Google’s browser automatically does this. 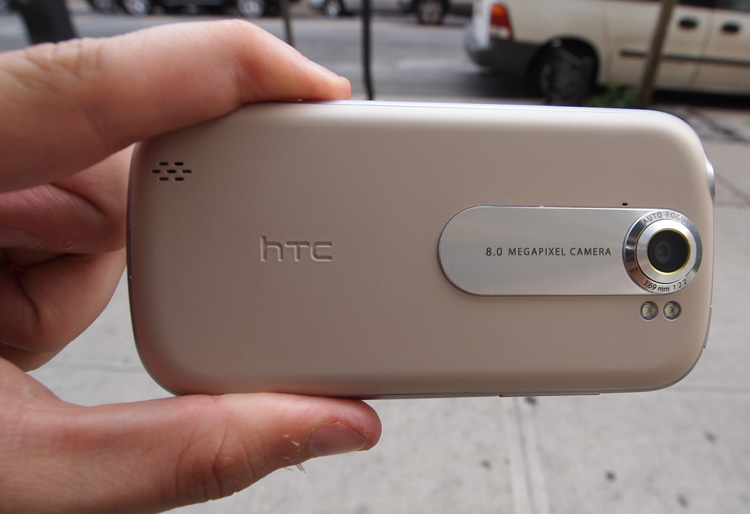 Why did HTC have to mess with it? The camera on the MyTouch 4G Slide is one of the best we’ve seen. It still can’t compare to an expensive point-and-shoot or some of Nokia’s cameras, but it’s as good as any other phone we’ve used this year. Like most HTC Android devices, the 8-megapixel rear camera on the 4G Slide picks up color well and works in darker and more challenging lighting conditions better than most. The autofocus is faster, as is the shutter speed (not an actual shutter, mind you) than most other phones. 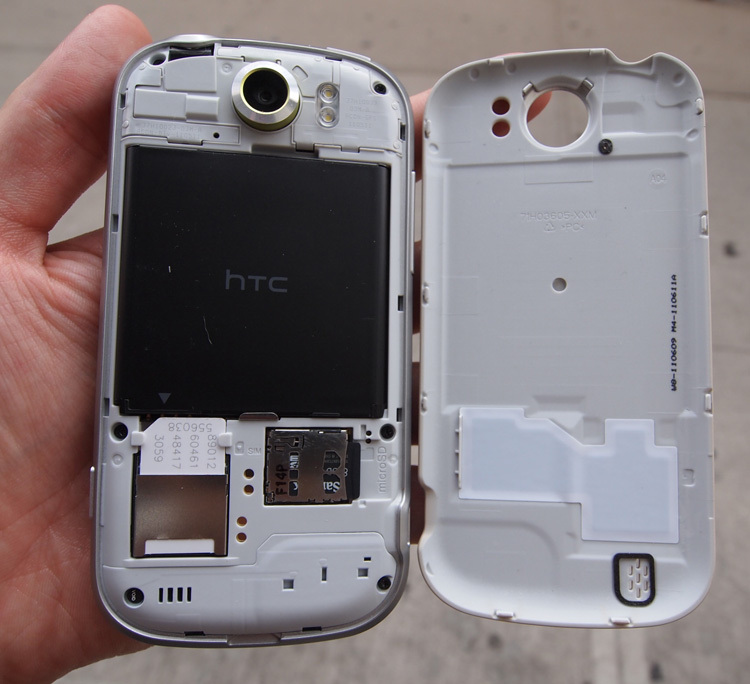 HTC’s software lets you tap anywhere on the screen to focus and refocuses whenever you move the camera. This could get annoying if you’re setting up a shot, but for a quick shoot, it should work well. We had no problems with the 1080p video recording either. Cool feature: you can refocus during a video. The phone has a dual LED flash as well, and the front-facing camera has some kind of facial recognition software built in, so it autofocuses on faces, though we wish it had a higher resolution than VGA. Call quality was good over T-Mobile’s network here in New York City, but “4G” HSPA+ data speeds have been terrible. We’ve been averaging about a third of one megabit per second (300Kbps to 400Kbps) download and upload speeds for the past few days. T-Mobile’s network must not be great in upper Manhattan. Before you purchase, test out T-Mobile’s network in your area. If you have a friend who uses the carrier, ask about their experiences, and download the Speedtest.net app on the phone. If you get good speeds, go for it. 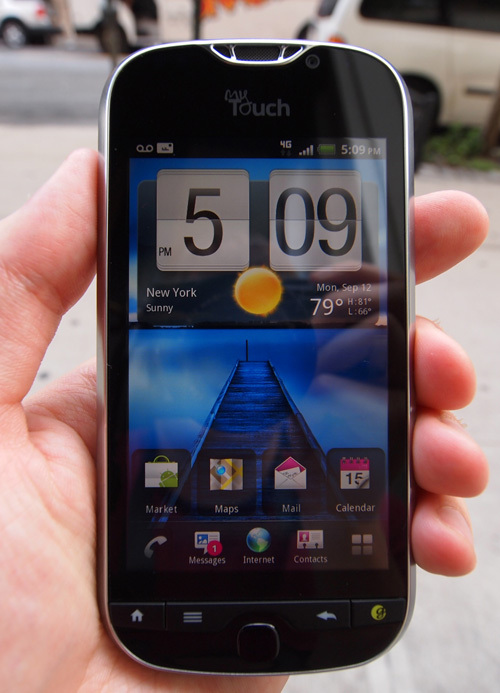 Like most HTC phones, we haven’t had any problems with the battery life on the MyTouch. The phone is officially rated for 9 hours of talk time and about 13 days of standby, meaning it should get you through the day, but the battery will drain a bit faster than some phones if you don’t charge it every few days. Mostly, you’re looking at a similar experience as with any other smartphone. You’ll be charging it every night. 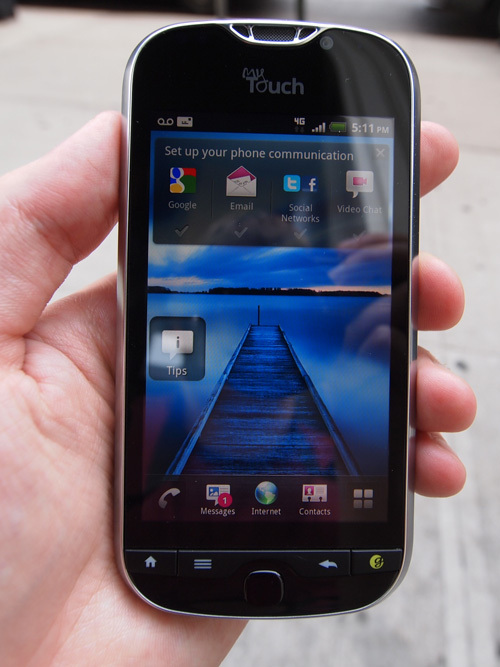 From afar, the MyTouch 4G Slide looks like just another Android phone, but this one packs some interesting strengths. It’s dual-core, has a full QWERTY keyboard, and an excellent camera. Did we mention it runs Android 2.3 and has a responsive 3.7-inch screen? For the $99 online price, The MyTouch 4G Slide is probably the best bargain on T-Mobile.